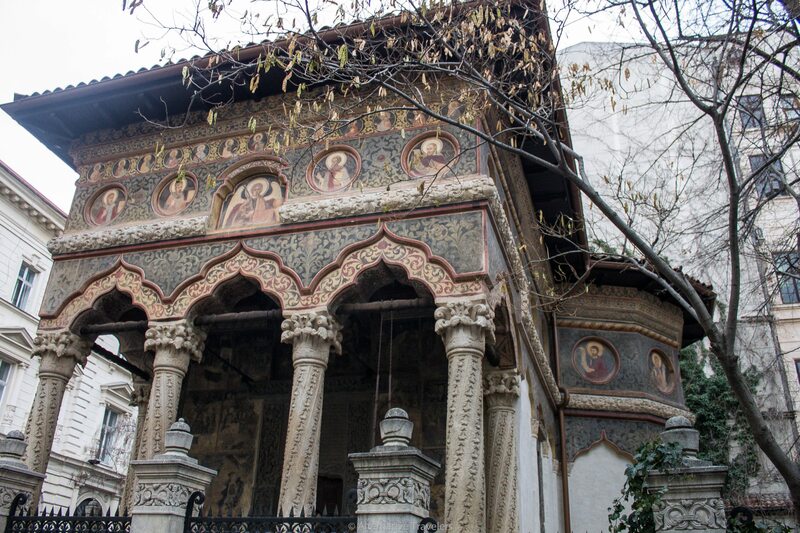 We never expected to find ourselves in Bucharest, Romania’s capital, in the dead of winter. Much like Bilbo suddenly finding himself in the middle of an unexpected adventure full of elves, dragons, dwarves, and jewels. But even minus the mystical creatures, but Bucharest was magical. Nicknamed the “Paris of the East,” Bucharest is a city that waits to be uncovered in small corners and teahouses that light up in the darkness of the streets without street lights, not one that is flashy and overwhelming. It was the exact opposite of Florence and exactly what we needed – and loved. I have been further East than Bucharest, but not by much. While Bucharest reminded me of Istanbul in some of the architecture and an abundance of kebab and falafel places everywhere, the city is entirely its own, with a unique history that I knew next to nothing about. They don’t teach Romanian history much in the U.S. Like that of its nearby cousin of which I have more familiarity, Hungary, Romania’s history is fragmented and complicated. We ended up in Bucharest for a few days following our time house sitting in Florence over winter break. We had been waiting for an opportunity to fall into our laps and show us what to do after our housesit yet that opportunity never came, or never seemed to come. Finally, we were stuck trying to find flights back to Madrid from Florence and found that the time we needed to travel – New Year’s Eve – was exorbitantly expensive. Naturally. Even experienced travelers make mistakes and we were determined to turn this one into something positive. After searching Skyscanner, using the everywhere function, I found 20 euro flights from Florence to Bucharest. A few days later, Bucharest to Madrid was only 60 euros, a far cry from the 200 euro flights from Florence to Madrid, and we got to experience a new place. We were sold. Who knew Bucharest had an Arch de Triumph? As we’ve said before, the people make the place. Through the power of couchsurfing, we connected with many interesting and welcoming people in Bucharest at vegan New Year’s Eve dinner party. But not without some transportation mishaps first – be forewarned travelers to Bucharest! We arrived at Bucharest’s airport – the main, international airport of the capital city of Romania – only to discover that there were virtually no available transport links to the city center. We had researched public transportation before, but none of it was running because of the holiday. And no one at the airport seemed to know that. Each desk we went to, if there was someone there at all, shrugged and told us to go elsewhere. No train. The bus ticket window was closed and you could not buy tickets on the bus. There was only one machine from which you could buy tickets…and it was out of order. Taxis were out as we had read horror stories on the Bucharest Wikitravel (stories that were later confirmed by Bucharesti locals). It seemed like we were defeated before we had even entered the city proper. We had just caved and downloaded Uber and were searching for our ride that was supposed to have arrived already (btw, not like we were ever big users, but we’ll never use Uber again because of this) when the bus pulled up. Other travelers started to explain about the unavailability of tickets so the bus driver shrugged and ushered us on. We took the bus to what looked to be a major transport link to another tram line. Instead, it was a dark, end of the line stop. Again, nowhere to buy tickets, but this time, we weren’t waiting around in the freezing cold. Instead, we hopped on the tram and took it to our stop. After searching amongst the Soviet bloc housing, we finally found our destination. Our host, Adina, graciously ushered into the warmth. We stayed up all night talking with other travelers and her friends from Bucharest as well. We knew we’d get along as soon as we saw her massive Tolkien collection and adorable black cat. This one will definitely go down as memorable New Year’s Eve history! She had made an entire banquet of vegan Persian food! Adina was essential in making our trip to Bucharest as enjoyable as it was and only further cemented our desire to only travel to places where we have or have made a personal connection. Adina (who is also an awesome artist – check out her stuff here) showed us her some of her favorite spots, from teahouses to abandoned man-made lakes. Veren described Bucharest as feeling like it was out of the video game Fallout, a post-apocalyptic city. It wasn’t uncommon to have to step over dead electrical cables draped over the sidewalk and there were still many abandoned buildings in the city center. The city is still clearly coming into its own. Adina told us about new artist initiatives and events going on (mostly in the summer of course, so we didn’t catch any). In many ways, it reminded me of what Budapest was probably like 10 years ago when the ruin pubs were still underground and not filled with tourists. It seemed like every place we went had been hidden until we stumbled upon a small intriguing sign that made us wander down a pathway or through a doorway. Tea houses are a big thing in Bucharest (as in Budapest) and they usually tend to be tucked away, perfect for cozying up inside for a little while. Also, there seems to usually be cats involved with these teahouses, so of course we’re fan. Serendipity Tea House tucked down a gravel driveway. Fluffball Supreme at Ceanaria 5, a tucked away teahouse that’s also a hostel. Another hidden surprise: Michael Jackson. Michael had chosen Bucharest as the filming location for the live video of his Dangerous Tour in order to highlight the struggles of the nation. Apparently, he subsidized the tickets to the extent that he made no money from the event – and this was to a sold-out crowd of 70,000 people! We had no tourist agenda while we were in Bucharest. We wandered and spent time in teahouses, talking to people. We also ate a lot of corvigi, a delightful and insanely cheap (25 cents) street snack that is everywhere in Bucharest. Bucharest was unlike any place we had been, a place in process of a rebirth. On the one hand, there’s the Soviet influence, which can be seen in dramatic huge buildings and bloc housing. On the other, there’s a younger generation of ambitious and bilingual Romanians that are both eager to improve their country yet at the same time frustrated at its current state. Although we were only in Bucharest a few days, we very much liked what we saw. We’re eager to return again and get to know more of this layered city and culture. Have you been to Bucharest or would you like to go? What should we know for our next trip there? Sam is a nomadic writer and photographer that freelances as an editor and proofreader, which may make her insufferable if you make any grammar mistakes in her presence. She has done stints as an archaeologist and tech writer in NYC and an English teacher in Madrid. She enjoys eating and photographing all the vegan food that Veren cooks. What is Slow Travel and Why Do It? We Were Nominated for a Liebster Award!